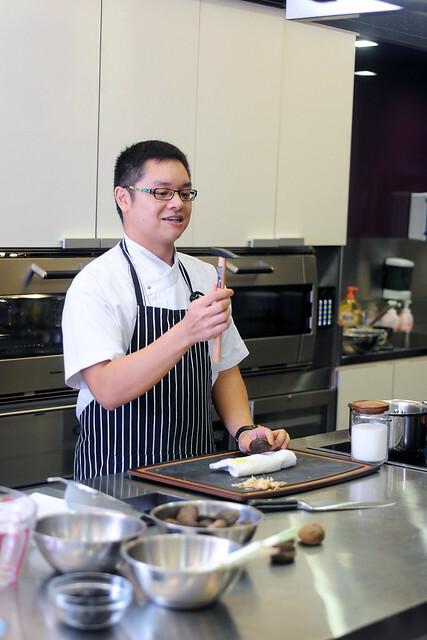 ToTT ran a series of demonstration cooking classes by some of the guest chefs which they’d been working with over the last year or so. This is in conjunction with their 2nd Anniversary since they opened their mega store in Sime Darby Centre along the prime stretch of District 10. 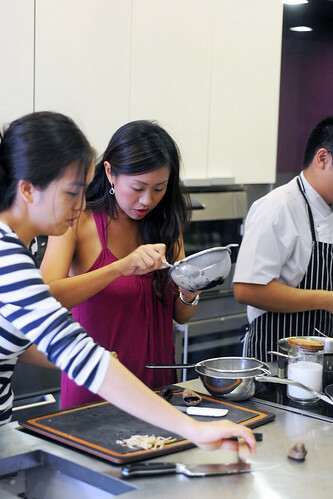 Despite being “only” demo classes priced within a range of SGD 28 to 38 for most classes, they are a steal! Not to mention that it also comes with a SGD 20 ToTT return shopping voucher! 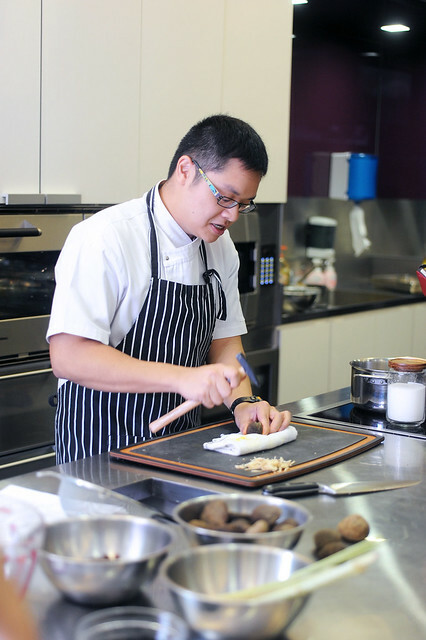 Wasted no time in checking out the schedule and blimey, they have exactly what I was looking for, a cooking class by Chef Malcolm Lee of Candlenut Kitchen which specialises in Peranakan (Straits Chinese) cuisine! And top it all, it was a signature dish in Nyonya cooking, Ayam Buah Keluak. When I shared this information with fellow foodies and makan enthusiasts in hope of some company to attend the class together. 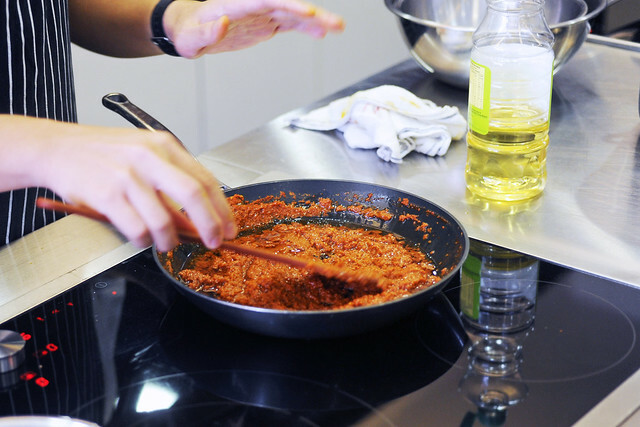 Most of them came back with comments like “Oh my goodness, must be very tedious and time consuming!” and ” Don’t you know how to cook Ayam Buah Keluak already?” Well, yes I do technically and in fact, I’d already blogged about it during the MFF Melaka month last August. But I’m always curious with how the others would prepare it. 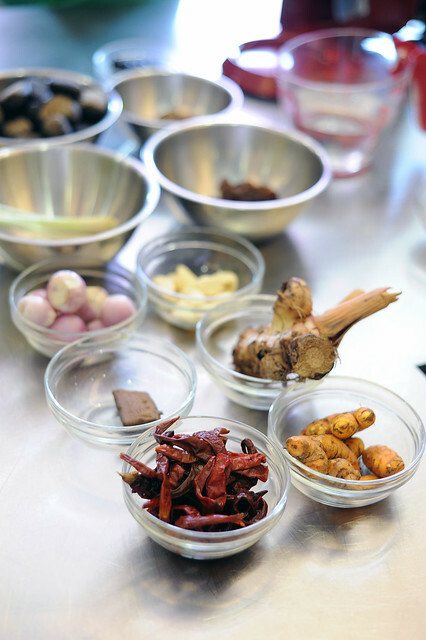 More often than not, different peranakan families have their own unique ways and “secret recipes” for preparing even the most common of all nyonya dishes like Hee Pio Soup and Ikan Gerang Asam. These ways of the past are often fiercely guarded by the old bibiks and carried to their graves. So here lies a chance to learn it from a true blue baba, and I’m not about to let it slip away! 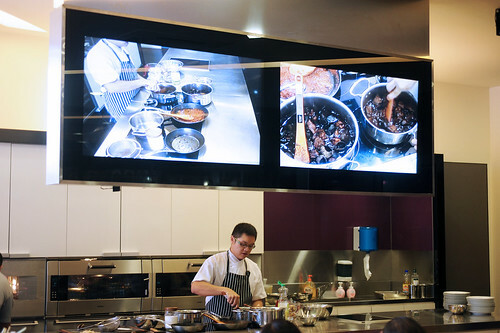 ToTT’s demo kitchen is eqipped with a couple of large LCD TVs and cameras fitted just above the chef’s workstation for one and all to have a good view of what’s cooking and stewing in those pots. 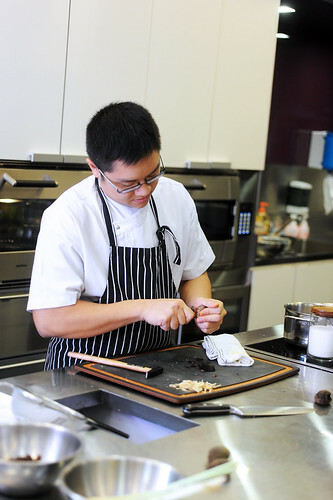 Chef Malcolm started by going through the list of ingredients required for making this dish. This was no easy task as it was soon met up by very very spontaneous questions from the audience who were all too eager to have their queries answers on the whys and what-nots on the making of Ayam Buah Keluak. 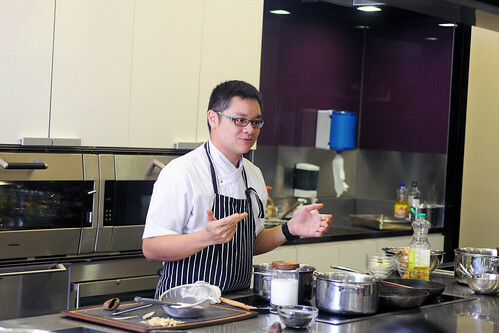 Then he proceeded to demonstrate some knife skills on chopping up the rempah ingredients and what to take note of. Then comes the actual blending of the rempah, where the ingredients have to be introduced into it in a specific order. Much much faster than using a batu lesung! 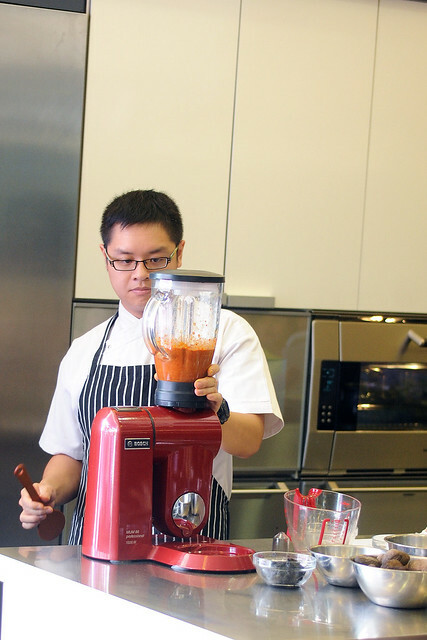 The electric blender also produces a much finer-grained rempah of course, which is preferred by Chef Malcolm. I actually prefer it to have slightly more textual contrast! Then comes the actual frying of the rempah, where he shared more tips on the finer aspects of preparation process, much to the “ooohs and aaaahs” of the ladies and gents around. I must say that I’d learnt quite a few things that I didn’t know before! Revelation!!! 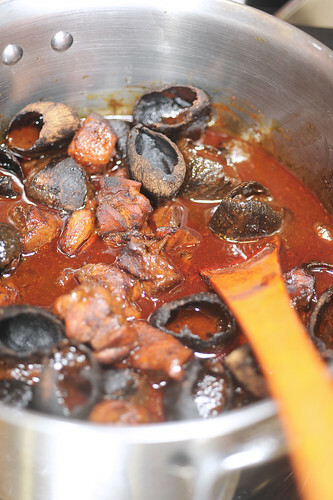 And finally we meet the “stars” of this dish. Hardly glittering or shiny, if not any at all, but very delicious nonetheless. He’d advised the soaking time of 3 days. I’d do it for 1 whole week interspersed with daily water changes and scrubbing! And his secret ingredient – a 2-bucks chisel hammer from Daiso! Whatever that works, right!? Digging out all that “black gold”! Straining the air asam aka tamarind juice, not forgetting to joke and laugh at the same time, maintaining the whole ambience relaxed all the while. 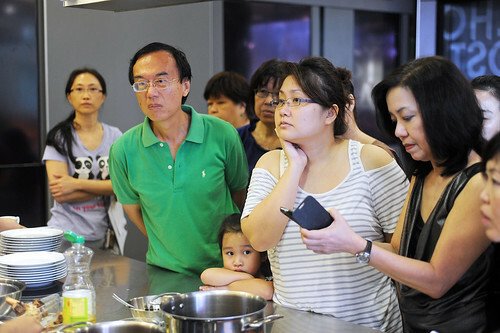 Then the final Q&A and food tasting session, where everyone gathers in front for more gruelling questions! Yes, everyone is dead serious about wanting to learn the ropes to making this right! 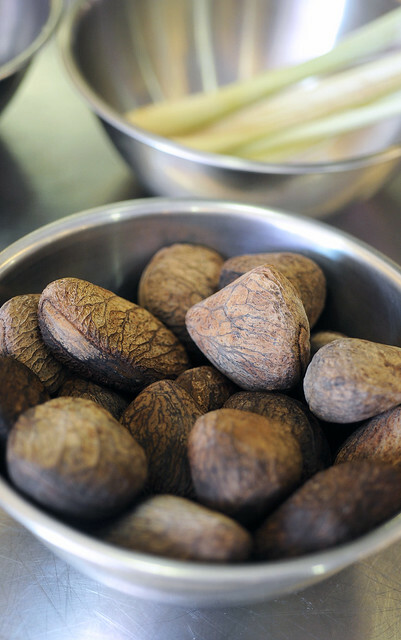 And experience for ourselves how difficult it is to press the buah keluak kernel through the hard-wired sieve which serves to create a finer texture, as well as remove bits of shell which might have been stuck onto the oily kernels. This is something which we do not do at home, but yet necessary according to Chef Malcolm who serves this at his restaurant. And the finished product! Looks so delectable isn’t it!? The gravy is significantly darker and thicker than what we usually make at home, due to the generous amount of buah keluak kernel that was added into the gravy itself. And boy ‘o boy was it delicious! Give me some of that kuah and a heapful of piping hot rice would keep me happy for a long time. But that was not all! 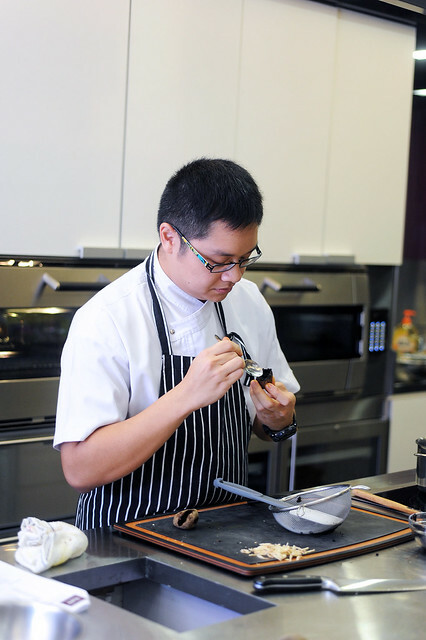 We were in for a special treat as Chef Malcolm also prepared “Daging Buah Keluak” using beef cheeks prepared via Sous Vide. That totally caught me off guard, but gosh, the flavours and textures were incredible!!! 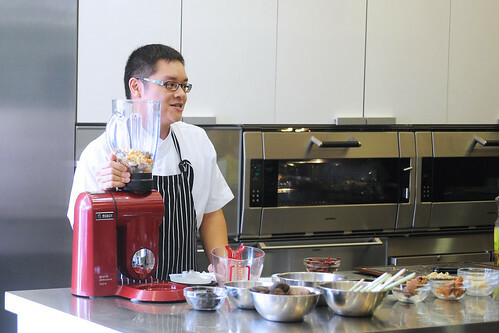 Can’t wait to try this at Chef Malcolm’s new restaurant! On the whole, this class is really much much more than what I had expected. To have learnt, tasted and experienced so much within such a short time frame of one and a half hours. Yes, the class was graciously extended due to the overtly enthusiastic crowd with all those burning questions to be answered! And to think all this was going for only effectively 8 bucks (minus the 20 bucks return voucher), that is just truly amazing. If this is not real value, I do not know what is! So kudos for ToTT for organising this wonderful class for all us participants who were lucky enough to have been there. And most importantly, a big thank you to Chef Malcolm for his generous sharing of cooking tips as well as all the delicious food prepared. Alas, this is a really late review as the anniversary sales are long over. 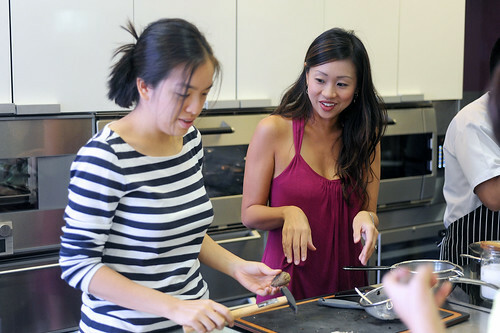 But do hop by ToTT’s website to check out on the other cooking and baking classes they have installed. 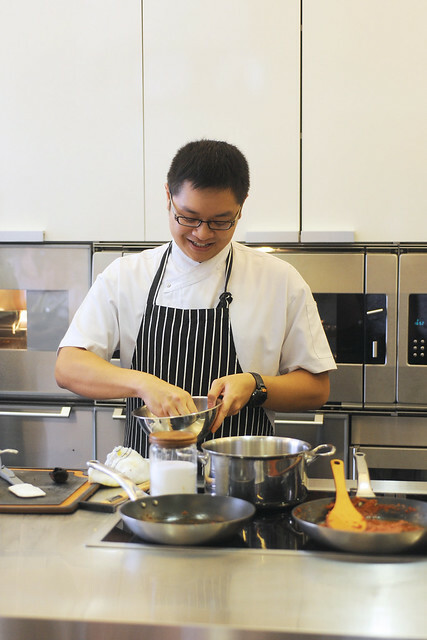 As for me, I’m gonna try out Chef Malcolm’s Ayam Buah Keluak recipe really soon! 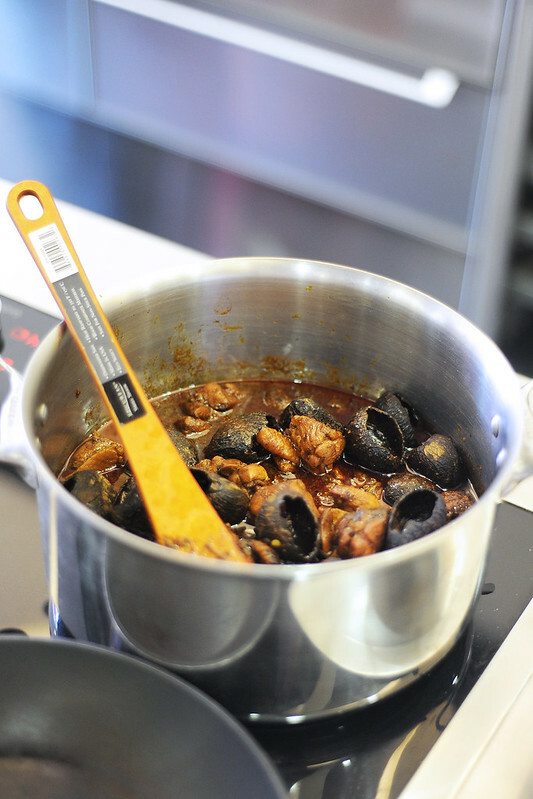 This entry was posted on January 3, 2013 by Alan (travellingfoodies). 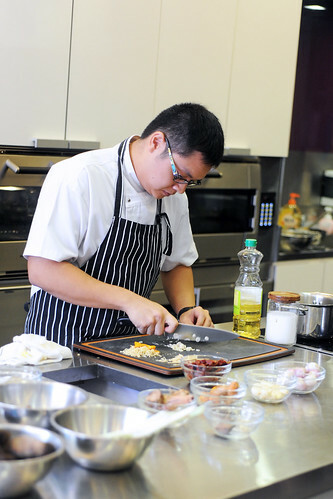 It was filed under Food and was tagged with anniversary cooking class, ayam buah keluak, Baba, candlenut, cooking class, demo, indonesian black nut, Nonya, Nyonya, Peranakan, Sia Huat, Sime Darby, straits chinese, ToTT, 土生华人, 娘惹黑壳馃焖鸡. one of my favorite dish using buah keluak, yum!